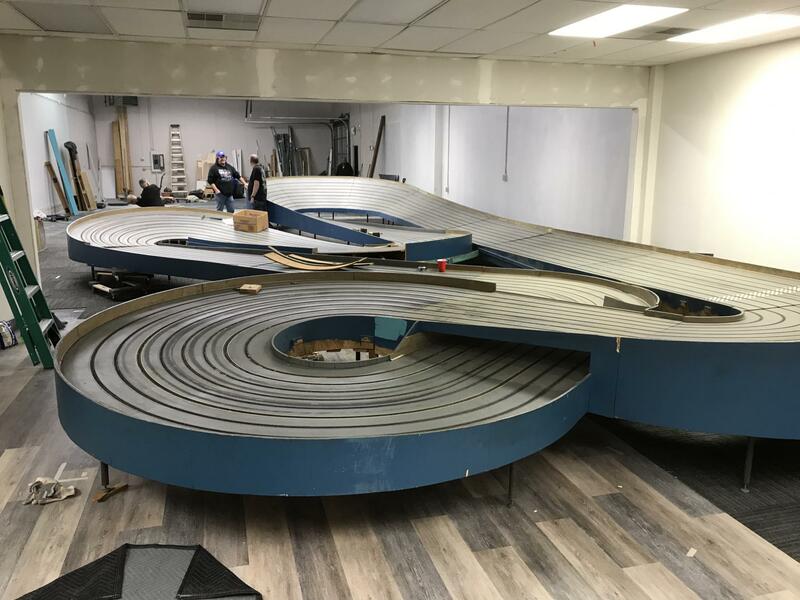 The King track that was supposed to be set up at Duffys is now being set up in Wheatridge, CO. We will be starting on braiding the track tomorrow. Look up Straight Line Speedway on Facebook. The new location is 5161 Ward Road in Wheat Ridge, CO. This pic is from a few weeks ago. There will also be an oval; the dragstrip is currently up and running. Got the black lane fully braided, the entire main straight finished and the bank braided in five lanes. sShould be done braiding Friday/Saturday this week. The wiring is all laid out, just need to reattach it all to the track and install the drivers stations. Should have power supplies later this week as well. That donut almost looks like it's reverse camber. 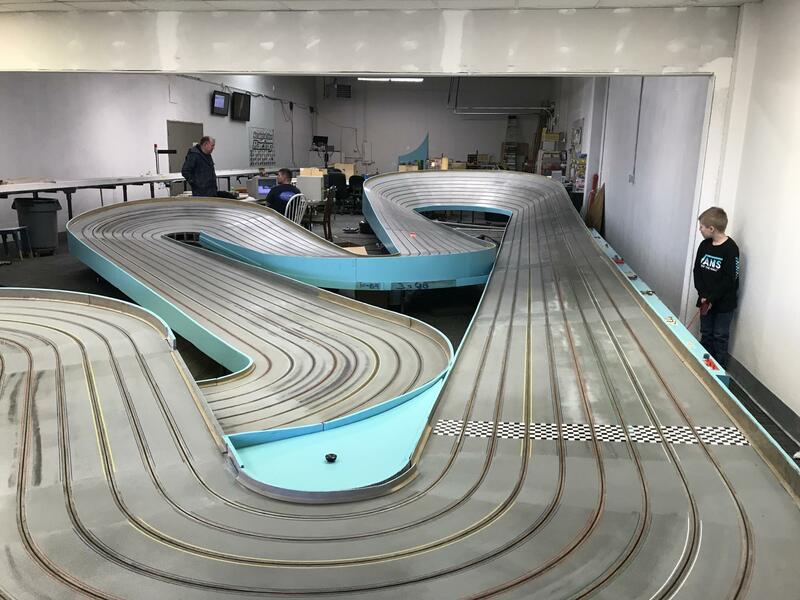 We have the King track that was to be located at Duffy's up and running, hopefully have the timing system on it and running by the end of next week. Ohmanohmanohman! We have a friggin' king track in Denver again! OK... where's my building jig and Unger iron? ex-King Louie Raceways (KCMO) slot car rat circa late 1960s. And from what I understand, Group 7s are lapping a 155' King at under 3 seconds now? Haven't built an open car since the '70s. Ohboyohboyohboy..... Holy Mike Steube, Batman! Actually, the current 1 lap record is 1.283 seconds by Brad Freisner. Don't blink or you'll miss it! LOL. Is this the King that used to be in the Greeley area? It's a Hasse-retopped American King that was in Bill Price's basement, and in a commercial raceway before that. PS: The walls weren't retained. It is not, this track belonged to Bill Price. He and his son had a raceway back in the '70s and early '80s down on Jewell and Sheridan, "Rocky Mountain Speedway" if I remember correctly. The track was set-up in the basement of the Price home until Matt Sheldon bought it last year. I raced on it back in the day. Not to be argumentative but if it is retopped and the walls were not retained, is it still an American King? OK the bones are American and it is not a punch bowl. Looks like it should be a great track. Thanks for the info! I worked in Littleton, during '95-'96 but didn't hear of this track's existence. Back then there was a track in a hobby shop on Colfax Ave. that people spoke of, but I don't think they ran 1/24. There was also a small track and hobby shop up in Thornton but they only raced HO. When I talked to Hasse (decades ago) about a track one of the possibilities was retopping an American track (orange). The track was so worn that only seven lanes were useable and one of those was on the edge of failure. His take on the concept was at that time: if the structure of the track was sound and if the track would fit the space requirements, then then retopping was an economically and structurally a feasible alternative to new cnstruction. As to what is a "real" King track, enough electrons and time have died on that debate that I will not add more. This is an American King that was resurfaced by Hasse in the 80s. I've heard people saying it ruined the track; if not for being resurfaced, it would have been firewood years ago. In a couple turns the original surface was so bad, when they patched it with Bondo before the resurface, it ran through to the bottom of the track. You could see in some of the turns on the old surface where there was a 1/4" of bondo on either side of the slot. Exactly, this track has a lot of history in the Denver area. Hoping to find some more lineage previous to the Prices purchasing it, they got it from a raceway in Livonia, Michigan, in about 1980-81 along with an American black and an orange. I almost forgot it was in Livonia. I raced there, in possibly early winter of '82, but most likely, winter, of '82/'83. Definitely winter. IIRC, they closed shortly after that race. My first slot car race was on that orange, Womps and Flexis.